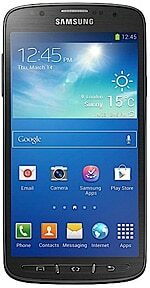 The Samsung Galaxy S4 Active is a ruggedised version of the company’s best selling flagship Galaxy S4. Aimed at “explorers and adventure seekers,” the NFC-enabled S4 Active’s fully sealed design is IP67 rated to keep dust particles out and protect against water damage for up to 30 minutes when submerged at a depth of up to one metre. A 5-inch 1080p display can be used with gloved hands, and a 1.9GHz quad-core processor running Android 4.2.2 and powerful 2,600mAh battery allow users to make the most of S4 Active’s 8MP rear camera with LED flash. The Galaxy S4 Active was announced in June 2013 and is available in grey, blue or orange.